A few years ago we introduced SOCCKET, an energy generating soccer ball that can provide light for children in developing nations.”Much more than a normal soccer ball, the SOCCKET is a portable generator that provides fun and power to those who play with it.” The invention has made the leap from innovative idea to reality with an improved prototype of SOCCKET that is already helping people around the world. The ball, which harnesses energy as it is kicked around, can light an LED lamp for a few hours at a time. 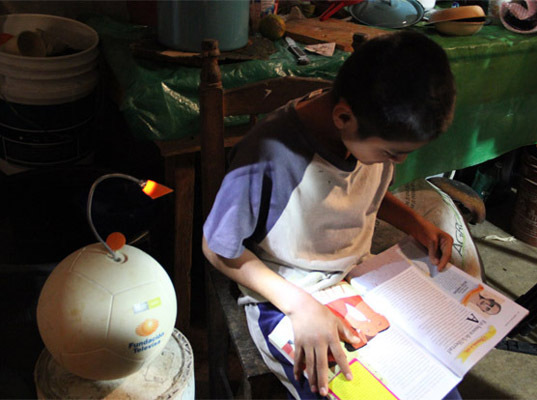 That means that a child who was forced to study by candle or kerosene light may now have a safe alternative for illumination – and he/she can have a ‘ball’ and get exercise while charging up too! Currently, SOCCKET developers are aiming to ramp up production and make more balls available across the world. Learn more about this inspiring toy/generator hybrid after the jump! 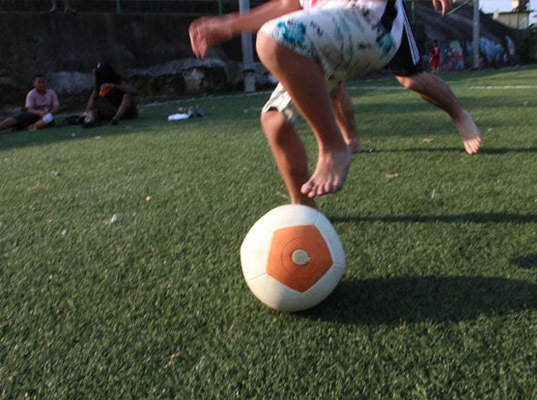 The SOCCKET ball uses Uncharted Play’s technology to capture the kinetic energy that is produced when the ball is moved. A pendulum-like device inside the ball captures and stores this energy, saving it until the LED light, which comes with the ball, is plugged in. With just three hours of play, the light can stay illuminated for three hours. The SOCCKET ball weighs only slightly more than a regular soccer ball and it is soft, durable and water resistant, making it pretty similar to the typical soccer ball. Right now, the ball is currently being used in the Americas to provide illumination and education, and about 100 soccer balls are produced each week. In order to keep the new-and-improved ball in production and manufactured in the US, and to ramp up development so that the ball can reach even more people, SOCCKET developers are asking for a little help via Kickstarter. With donations, the project can be expanded and new technology can be implemented. In fact, if the campaign reaches its goal of $100,000, an energy-tracking device will be included with the SOCCKET. If the campaign reaches $150,000, an emergency cellphone charger will be included. Head on over to Kickstarter and help the campaign reach its goals and make a difference. A few years ago we introduced SOCCKET, an energy generating soccer ball that can provide light for children in developing nations. "Much more than a normal soccer ball, the SOCCKET is a portable generator that provides fun and power to those who play with it." The invention has made the leap from innovative idea to reality with an improved prototype of SOCCKET that is already helping people around the world. The ball, which harnesses energy as it is kicked around, can light an LED lamp for a few hours at a time. That means that a child who was forced to study by candle or kerosene light may now have a safe alternative for illumination � and he/she can have a 'ball' and get exercise while charging up too! Currently, SOCCKET developers are aiming to ramp up production and make more balls available across the world. Learn more about this inspiring toy/generator hybrid after the jump!